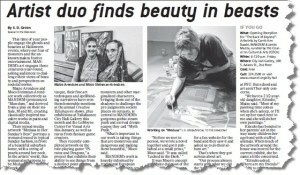 ”Artist duo finds beauty in beasts” by S.D. Green, appearing in the Tallahassee Democrat Sunday Magazine on 10/13/13 (page F07). This article was part of an series of articles by COCA (Council on Culture & Arts) showcasing the work of noteworthy regional artists. October has been a busy month for FSU student MANDEM (MFA Studio Art, ’15), whose work has been shown this month at the Tallahassee City Hall Art Gallery, Gadsden Arts Center, 1020 Art Gallery, Fermentation Lounge, and the new CAB gallery. An interview with FSU art student MANDEM is featured in the October issue of The Capital City Villager, a quarterly newspaper in Tallahassee whose journalistic mission is to fill the gaps left by other local media and to pursue content that has impact in our community. The issue can be read online (http://bit.ly/1gNdSZj) and print copies can be picked up at many distribution locations around Tallahassee. MANDEM was also featured in the Tallahassee Democrat’s Sunday Magazine section on October 13th. Visit MANDEM on the web at www.MythpunkArt.com to follow their upcoming interviews, publications, and gallery shows throughout the coming months.